Try filtering the fine grind out using a filter paper after the plunging. Keep working away at it. Hey guys, I was really hoping I might be able to get some recommendations on a good drip machine to buy? Last summer I bought myself a generic one off eBay. If you search for cold drip machine on there, it's the one with the silver steel frame/collar, spherical top flask and cylindrical bottom flask. It came with filters, and worked really well. So well that some work colleagues were running two at work overnight and bottling their brew to sell at work! The tap is a little fiddly, but I'm no expert and was able to get a good result. Let me know if you get one I'll give you more detailed instructions. So I am thinking of upgrading my coffee selection. I have always just gone for fairly cheap coffee and got decent results, however I just tried Grinders new cold brew concentrate (I tend to try all new cold brews just out of respect) and it is very tasty. So I am looking at some single origins. I have gone back through this thread for some ideas. However I am thinking I will go with a natural Ethiopian bean from what I learned from this video https://youtu.be/N8meCjVsJWI . I am looking at roasted beans don't have time to roast my own with twin boys at home. Has anybody tried Ethiopian, does this work with cold brew, is it worth ~$50/kg instead of $12 Aldi (not bad coffee tbh). Well, there's quite a variety of Ethiopian beans.....but the ones I've used in cold drip (not cold brew....just haven't tried) have worked really well. Have largely used Yirgacheffe for this purpose. Thanks Barry I will definitely give Yirgacheffe a go. Also does anybody have any suggestions / condemnations of online roasters. 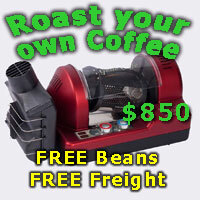 I will get to a local roaster here in Adelaide but it is not always convenient. Also I noticed on the Grinders cold brew their brew time is 6 - 8 hours. Originally I used to brew for 24 hours but have reduced this to 18, thinking I might try going for 8. Again love to hear peoples experiences. Ethiopian Harrar Longberry Horse roasted and aged to bring out the strong wild blueberry note. Absolute stunner! dan77 and Dimal like this. I just finished a bottle of Harrar. Was amazing. I roasted a little darker than some would for cold drip and was a fruity chocolate drink. Perfect for pick me ups at work. Looks very simple and pretty well foolproof too I'd reckon. It is available to buy in Oz, just need to do a search to locate them. I have the Kilner version Mal, it was in an online sell out so cheap azz. So simple its brilliant. I think recently some company released a cold brew gizmo that uses your existing aeropress coffee maker to make cold brew. I think its called puckpuck. Anyone have any experiences with them? That is exactly what I want to do! What do I need to make nitro coffee at home (have the cold brew)? Ballpark cost? Has anyone used a whipped cream dispenser propelled by a N2O cartridge for nitro cold brew? Nitrous oxide and nitrogen are different things. Nitrogen works because it is almost insoluble in water so it forms long lasting bubbles. Nitrous oxide is far more soluble so this doesn't apply. Thanks, thought it would be a simple way to have a play at home. Yes it would be a simple way to play (in smaller volumes), at least a proof of concept. N2O (Nitrous Oxide) is what they are using in the kit to produce the "Guinness" style coffee, I'm not sure how much difference the nozzle on the tap makes so your cream dispenser might not work exactly the same. The ratios of liquid to gas will also be different as their 2 litre keg uses two N2O cartridges to charge it and I don't think cream dispensers are a litre. I prefer the N2O coffees to the nitrogen or even carbon dioxide ones, fizzy coffee is just too weird and CO2 is too 'salty'. I can see a CS'r run on op-shops for 1970's soda syphons coming too. I should have checked before replying: the only "nitro" setups I'd seen used nitrogen so I assumed that's what he meant. The ikegger says it has a fine mesh to force the coffee through. Will give it a bash and report back. Need to find a whipped cream dispenser! 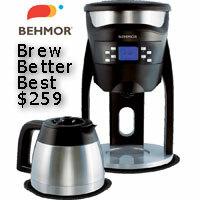 Has anyone noticed the Bru cold brewer at aldi for $25, looks like a cheap way to give it a go for those who aren't sure. I gave the nitro cold brew a bash. Used a half litre whipped cream dispensor, initially tried it with N20 cartridges (easy to get), but the result was very bubbly. I then did another batch and found some nitrogen only cartridges. The result was awesome, super creamy mouth feel, and looks and behaves like guiness in the glass. creamy head and the cascading effect. LeroyC, shrubbface and Zee like this. I give up, the nitrogen must make the coffee go sideways! Click on the thumbnail, and then click again on the pic that comes up and you'll have your right-side-up image. I have something like this - it's a Nitroking I got off kickstarter ages ago for about $150 a few years back, included hand grinder, cold brew maker etc. It's quite cool and, as mentioned above, great for proof of concept and messing about. We're opening up a small cafe in the Philippines, and we're basically using it as a test bed. As for my cold brew, I ended up buying a stainless steel pot for about $50, installing a tap at the bottom, and am using cheesecloth to filter. I then pour the brew into a glass container through a paper coffee filters at the end. The whole thing cost me under $100, though you kinda want to be making a lot of cold brew! I still use french press and a couple of Hario cold brew maker thingies to test flavours though. BTW - try coconut cream in cold brew - YUMMY! It's better if you can get fresh stuff, but I've never looked for it in Aus, though I'm sure the canned coconut cream will do the trick. I just picked up a Hario Cold Drip (WDC-6) and enjoying it so far. I've made about 6+ batches of varying amounts while I tweak my recipe, however the last couple of batches I'm really struggling getting a consistent drip rate for any length of time. I'm aiming for around 1 drip every 2 seconds, and can usually maintain this for a short while but eventually it slows down and at some point completely stops. So I'm having to constantly monitor it which is getting tedious now. I've tried ice with the water, as well as just cold filtered water, but neither seems to be helping. Hi defiant, welcome to the community. Are you referring to the top drip tap or what comes through the coffee? Talking about the drip from the tap. No matter what I've tried the drip from the tap stalls, whether its a few seconds, minutes or hours it'll stall. I'm wondering if its a faulty tap, either that or there's something wrong with the water I'm using. Just using a brita water filter. Here's a video of what I'm talking about, you can see it stalls twice. The drip rate in the video is not what I'm aiming for, it's just to demonstrate how it slows down and eventually stops. There's about 500mls of ice/water in the top container and had been running for about an hour or so already (started with 600mls ice/water). Very curious to know if there would be any real difference between this, and say this, as in whether or not the double filter thing makes any real difference. Put a brew on last night, got about 300mls extracted before the drip stalled. I've tried room temp water, cold water, ice water and room temp works best but still have to constantly monitor it. Got it from Amazon, and it's not eligible for return (because it's an item related to something edible) otherwise I would return it for a refund as it's no good. I've ordered a replacement tap to see if that's any good before I pack it and sell it on. Sounds like a faulty tap. It does slow due to water pressure but it shouldn't stop completely. Yeah, I'd expect it to slow down as the water level drops but not to stop completely even when there's enough water in there. I've got a replacement tap coming. Out of interest, as you've used the Tiamo before do you think the tap could be made to fit in the Hario? I'm thinking of ordering the Tiamo tap as well to see if that's any better. My Cold Bruer will stop completely if I don't keep adjusting the drip rate. I try to adjust it around every hour over the 6-8 hours. If I don't adjust it after about 4 hours it will be stopped and still have water in the top when I come back to it several hours later. A friend, with the older style Hario tap said his one stalls too. If I want a truly set and forget one it looks like the Tiamo bamboo is a good option with the way their top reservoir is inverted? This is why I got rid of my cold bruer. Loved it but couldn’t be there all the time to adjust. I have the Bruer and cant recall it ever stalling? Seems to work quite well. I am not familiar with the Hario. Maybe wait to see how the new tap goes. Failing that start with a higher drip rate and see how you go. The point is, the coffee needs to saturate which will happen slower at a slow drip rate or faster at a faster drip rate but from my years of playing I haven’t found any difference. Saturation is saturation. There might be someone who knows more about this than me but that is my simple view. I speed up my drip as the coffee drips through and if anything, I’ve found that the coffee tastes better when I finish the drip off quickly. I've stopped and using the Cold Bruer since I got a Hario Mizudashi a little while ago. After accidentally having the Bruer stall with only ~150ml in the bottom it was the best cold drip I'd ever had, which got me thinking that the bitterness in cold drip was in fact over extraction. After playing with the recipe to intentionally put less water in I came to the conclusion that it was better but I feel that drip is fundamentally flawed (or at least how I'm doing it). It seems to me that even with an Aeropress filter on top the water won't saturate the grinds evenly, and will likely have a channel where the water flows easier, the second that happens it gets easier and easier as the dissolvable parts are carried away. Meaning that to get an even extraxtion I'm not actually able to use 75% of the beans I'm grinding. When I remembered the Mizudashi was ~$30 I thought I was worth a try. It produces different tastes than the drip, bit less punch on the front but also much smoother on the back, and because the bitterness is gone the aftertaste hangs around for ages. So now typing this I'm wondering if presaturating the grinds by creating a slurry in a cup then somehow transferring into the brew chamber (so saturation might happen all at once and then the in -> out water flow is even from the start) would reduce the likelihood of the unbalanced extraction and bitterness on the back end. Inspired by the recent posts I put a batch of Yemen Mocha Ismaili on today. Beans are about 9 days post roast. 100g coffee, 75ml of vodka used for pre-wetting and 900ml of water through. Good smells coming off the rig whilst it was going. Tempted to try Artman's nitro method. • Hot water bloom - 85deg water and 1:1 ratio. • Stir gently but fully. Then wait 30secs. • Add cold water to bring up to a final ratio of 5:1. • Brew for 12hrs at a low room temp (about 16deg is ideal). We’ve now got a commercial size Toddy and will probably brew in a dedicated fridge going forward just for consistency. Brew time will be extended to at least 18hrs in this case. I’ve never liked ‘traditional’ cold brew, but I’m really enjoying the results we’re getting. Has some serious punch as a concentrate, but is also really nice diluted. bazzawill, dan77, Dimal and 2 others like this. Either either really. Having a sealed lid is good for a couple of reasons- you can give it a bit of a shake to ensure all the grounds are wet and you can also brew upside down to allow for a tighter brew ratio and get closer to a concentrate. Vodka? Interested... Do tell - does it affect taste (for the better)? From the couple of basic trials i've done it seems to broaden the flavour profile, for lack of a better term. Could just be the placebo though. I’ve tried vodka, port, 4 pillars Shiraz Gin, and warm sake! I really like using sake because of its mild flavour, warming it and having a swig as I stir it into the grinds with a skewer. Just got my hands on some lactic geisha. This $tuff is too good for espresso, into the Hario dripper she goes! Mmmmmmmmmmmmmmmm! Better than I was expecting for a home version. Still nice and creamy. Thanks wife! artman, bazzawill, Dimal and 1 others like this. For those interested the tiamo tap fits in the hario. Getting much better drip consistency with this tap over the hario, and so far it hasn't stalled on me. I don't think you're ever going to get drip consistency (and avoid stalling) while the weight of a water over the tap is reducing. Some units come with a widget and extra chamber to eliminate this problem. Exe but great in my experience.